With a tongue-in-cheek reference to their GTA name, the Goons Take America tour is set to kick off November 6th at Opera Nightclub in Atlanta, GA before heading out to 15 more stops around the country. 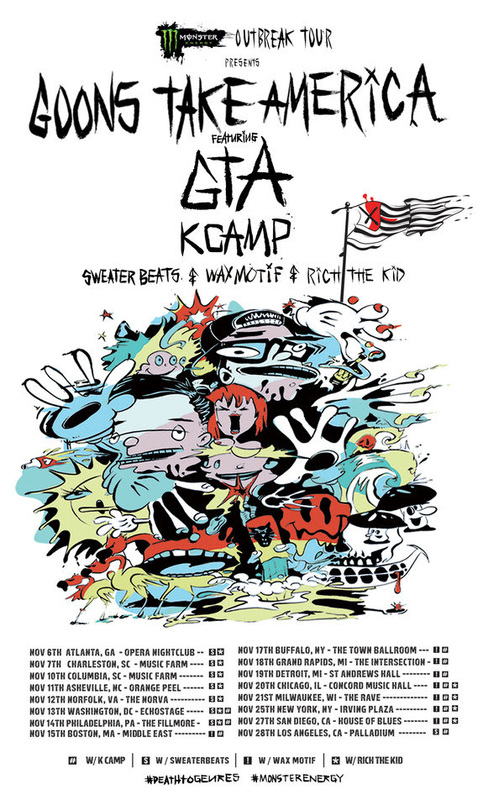 On tour with GTA are the likes of K Camp, Sweater Beats, Wax Motif, and Rich The Kid. This kind of party is hard to find anywhere else so make sure you check out the tour schedule in the picture above and grab your tickets before it’s too late. Not content with just announcing a huge North American tour, the boys have released their music video for their latest track “Smoker’s Unite” that features Paul Wall and Clyde Carson. The video captures the guys performing and getting fitted for grills alongside cameos from the likes of Diplo. And if that weren’t enough for one announcement, GTA is also giving away their remix for K Camp’s “Lil Bit!” as a free download! Check out the video below and make sure to grab your tickets for the closest date on the Goons Take America Tour.